Another classic old wargame, first released by Avalon Hill in 1996 and now back in a beautifully designed edition by Valley Games. 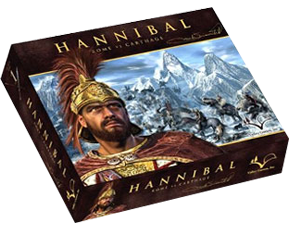 Hannibal: Rome vs Carthage is a somewhat complex counter-and-map simulation of the Second Punic War from 218 to 201 BC when the Carthaginian general Hannibal came close to defeating the might of the Roman Empire. Famously, Hannibal drove war elephants with his army over the Alps to invade Italy, and so can you if you play this involving game – but you’ll have to wield political control as well to achieve victory. It has some modern elements that were later to become game standards, like card-driven actions and combat. Some lovely graphic design by Mike Doyle, though it’s a shame he didn’t design the board as well. Thanks for letting me know. They asked to use my player aid for the new version and I got a credit in the rulebook, but I don’t know what happened between that request and the publication of the game. The final player aid was nothing like mine. I’ve not used the player aid they released, since I saw some comments on BGG that it contained some errors. They also took a lot of flak regarding the new rule book, which was completely unnecessary IMO, since it was almost exactly the same as the previous version, but with a much better layout and gameplay examples even. The playbook seemed a bit hurried though, but it serves as a good way to introduce more rules step by step in a quite complex game to get your head around at first. But once you got a few games in, it’s a rewarding game with great tension, reminds me of WotR in that regard. Well, I hope they dig it out and publish your original work. I never got around to playing the old version. I’ve got the new version, but the rulebook looks like a slog and it all sems so unnecessarilt complex! So I can play the new version armed just with my summary? I’ve always wanted to play it but never put the time aside. Your rules summary is essential, and I don’t think I would have endured my first playthrough of the VG edition without it! But I recommend slogging through the rule book first before diving in, since there is a lot going on in this game. Then just your summary will most certainly suffice. Oh, that’s good. I didn’t actually know how helpful it was as I never got around to playing. Thanks for the links. I will indeed wait!